Designs by Lisa Somerville: Kitchen Sink Stamps - New Releases, Ribbons with a Cause Program and a Special! 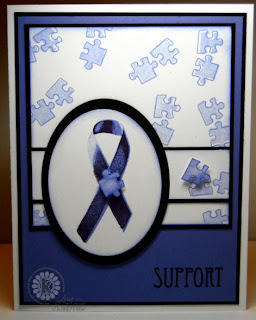 Kitchen Sink Stamps - New Releases, Ribbons with a Cause Program and a Special! This card uses images from the Multi Step Ribbons with a Cause Set and Multi Step Christmas Lights. I used the small flower from the Ribbon Causes set to create my own pattern paper. 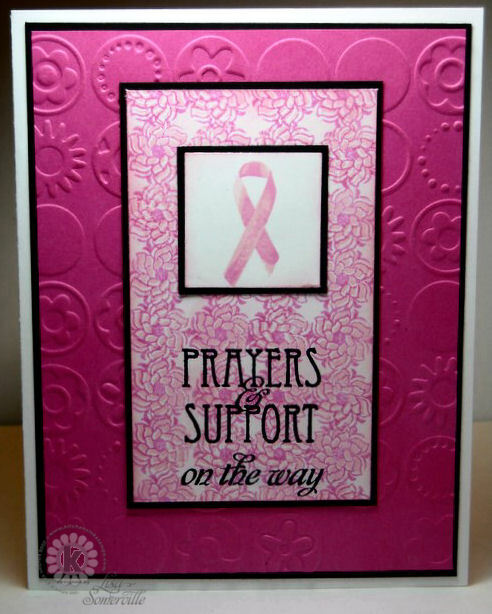 The above card uses images from the Multi Step Ribbons with a Cause Set. I used the small puzzle pieces to create my own background. I cut two of the puzzle pieces and placed one on the ribbon and the other on the panel as shown using dimensionals. 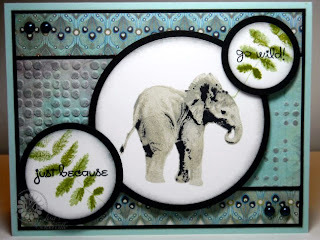 For this card I used the Multi Step Lil' Elephant, and Multi Step Big Leaves, along with the fun Card Patterns Sketch 81. The panel behind the elephant is embossed with a Texture Fades folder, then lightly inked with Pumice Stone Distress Ink. Wow, have you been bz! FAB cards, that ribbon looks like it's so real, shines like satin! The detail in the efelant (joke) is amazing, very cre8tive GF! Beautiful cards. Love the elephant card! Great use if the sketch! Love the ribbon set. 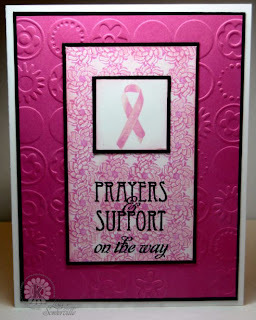 These are wonderful cards, and I am sure the ribbon cards will be especially popular! Thank you for the tutorials! I love how you showed how you made your dp! I really like the dp for the Autism card. That little elephant is adorable! I really like it! Thank you for sharing so much, Lisa! What sensational work with these amazing images, Lisa!! I love what you have created with the Ribbons with a Cause!! I know this set will be popular!! Wonderful work with that lil' elephant, too! He is the cutest thing!! Oh Lisa! These are all so wonderful!! 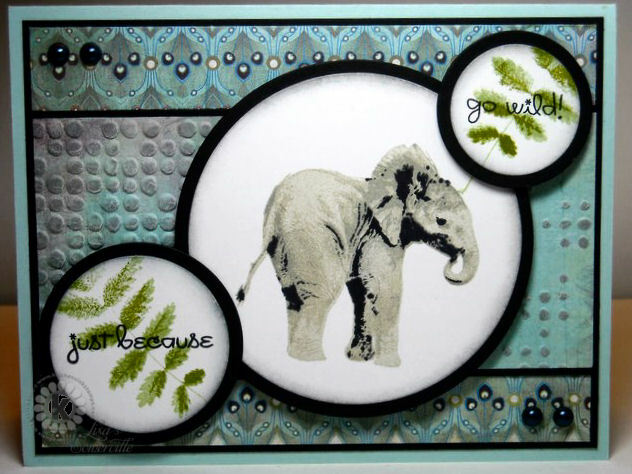 Your cause cards are great...show the versatility of this set, and your elephant is perfect! All cards are so fantastic, Lisa! 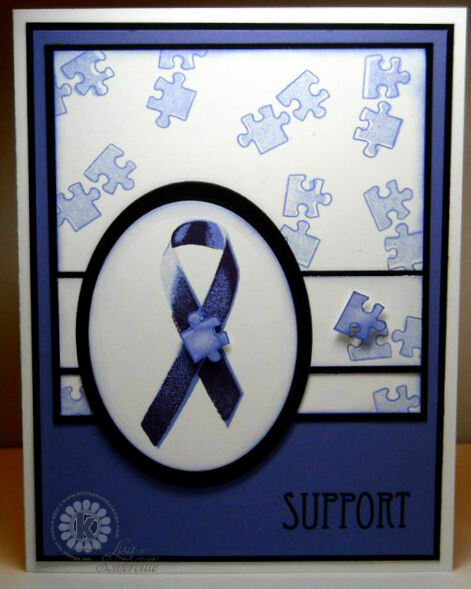 Each of them has a beautiful details but I especially love your Autism ribbon card. Fabulous work as always! Wow, your elephant is beautiful. Thanks for playing with us at Card Patterns this week. Lisa these are beautiful cards! Love your take on the CP sketch and glad you could join us this week!